EcoFlex Pavement Signs, eco-friendly, double sided pavement signs, the perfect solution for on street advertising. The Uk's most popular choice for printed street signage. EcoFlex signage is among the top selling individual pavement sign in the UK. Supplied with an aircraft grade 1.2mm aluminium panel making it suitable for all weather elements, graphics can be printed direct or vinyl applied which allows for easy to replace graphics. The unique wedge base means assembly and disassembly can be arranged quickly and easily, with no tools required, and allowing for easy storage. The fully recycled PVC base provides great stability in all conditions. 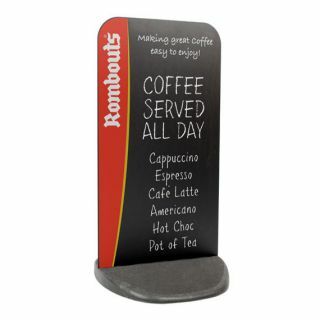 Panels can also be custom cut to shape for a more visually striking point of sale display and can be supplied with an aluminium or chalkboard panel. Is the printed graphic supplied with the EcoFlex Sign? Yes, our EcoFlex pavement signs are supplied with printed artwork as standard. Can I change the graphics on the EcoFlex Sign? Yes, if the sign has been vinyl applied the graphics can be removed and replaced. Can you print replacement graphics for the EcoFlex Sign? Yes, if you already have already purchased an EcoFlex sign from us, we can print vinyl graphics for you to apply over your current sign.